Deaf dog: Klondike Constantine, a three-year-old mixed breed, is the smartest dog her guardian has ever had. Her mom says, "Most people don't even know she is deaf because she is so observant. She is a little booger because if she doesn't want to 'listen' she turns her head so that she doesn't see the hand signals!" Other pets: Kalli, a 6-year-old rescued Golden Retriever; Ripple, a 10-year-old cat; Simba, a 6-year-old cat. 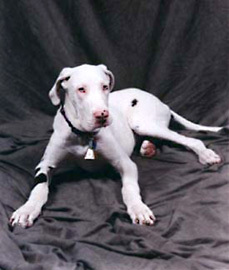 Deaf dog: Anniebelle is a 1 year old pure white Great Dane. She spends most of her day running around and playing with her brother Holstien. She is one of the best great danes in the world. Other pets: Holstien a 1 year old Great Dane. Deaf dogs: Kismet is an 8 month old English Setter. Her parents write, "Kismet came to us through a series of unbelievable linked events (hence the name). I wasn't actively looking for a deaf dog, but when this little girl appeared and needed a temporary home (rescued from her owner, who wanted her for hunting and decided to have her PTS when he found out she was deaf), I just couldn't refuse. Well, the foster situation turned into a permanent one because we just couldn't imagine parting with that little sweetie! Kizzy has an intensity and exuberance for life that is a lot of fun, but can make her a bit...um...difficult at times. But she's such a joy that we can overlook (and continue training to improve!) her few shortcomings. After all, she's just a pee-wee! She's got plenty of time to learn. She really likes to play with our 95 lb Gordon Setter Charlie." 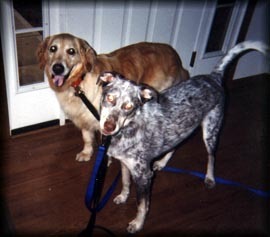 Other pets: Charlie, a Gordon Setter; Squirt, an Irish Setter; Spot, a cat; Beauregard, a turtle. Deaf dog: China (Yorkshire Terrier) is the most loveable little baby! She loves to cuddle and to give kisses. She has a favorite toy that she carries with her, and she will ALWAYS want someone to play with her. China is a Puppy Mill Rescue dog, and my vet wasn't sure she'd live to see her first birthday, as she has neurological problems also. Deaf dog: Barry is a very sweet, loyal Jack Russell Terrier. We got Barry when he was 9 weeks old. I don't think he was totaly deaf, like he is now. He has adjusted well and watches our other dogs for directions. He knows a few tricks and I have started to teach him some signs. He is very good with my children. Human companions: Sherry and Todd Kitner, and 2 children, Dane, 9 and Derick, 6. Other pets: We also have 3 Chihuahuas. 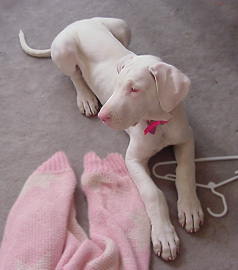 Deaf dog: Bug is a 12 week old Great Dane. Her family says "We have a new baby named 'BUG.' She is a delight to us and we are enjoying her very much, although she is my first experience with a deaf dog. She was born here to my wonderful dog, Mercedes and several of the puppies in this litter have gone to show homes. Several people suggested I put Bug down....but I just didn't have the heart do to that and I have not regreted it for one minute. She is learning skills. We live on a farm and Bug loves to run and play with her sisters but sometimes getting her attention then is a bit of a challenge. We love her and will give her a permanent home unless we found a perfect home for her. She is easy to have around and doing very well so far. I believe each dog should be given a chance. 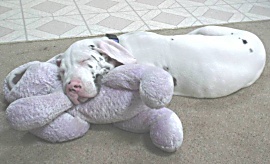 Most people and breeders advise to put deaf Danes down...and if they are vicious and proven to not be fit, I agree, but not just because a puppy or adult is deaf. That is just not enough reason to put ANY dog to sleep." Deaf dog: Montana is a 9 month old Great Dane. His family says "Montana is the sweetest dog we have ever had. He loves to lay on your chest if you are talking or humming. He also loves to come up to you and just shove those big lips in your face for kisses. He is very easy going. We also have another Dane and 2 Dalmatians. They are the ones confused. If they have a toy that Montana wants, Montana just comes up to them and takes it. They raise their lips and growl a little, but always give in to him. I don't think they understand why he doesn't stop with their attempted correction. But they are all very tolerante. He is very smart, and may be easier to train than the Dane who can hear. I wouldn't trade him for anything in the world. When he looks at me with those big blue eyes I know he loves me and is happy. Since we got him from a rescue I wish I knew what his background was. I know he was kept in a garage for months because he was "stupid". But I don't think he was abused, just neglected. Anyway, we are doing our best to make up for all that he has been through. Bruce is a 13 year old Dalmatian. His family says "Bruce is also the sweetest guy in the world. He is gradually losing his hearing because of old age. He can hear a little, but when he is sleeping a bomb can go off in the house and he would still be snoring. Just from living with him for 13 years, we don't have to do anything special for him. He already knows all the rules. If we are walking he never leaves my side and always did look at me constantly to see what we were going to do next. He is so easy, the only way we knew he was going deaf was because he never woke up from naps. Even when the other 3 dogs were running around the house barking and carring on. I hope he lives another 13 years because he really is my best friend." Other pets: Claire - Great Dane 3 yrs old, Jackson - Dalmatian 5 years old. Deaf dog: Pete is a 14 year old Terrier Mix who has gone deaf in his old age. Deaf dog: Destiny is a 1-1/2 year old Boxer. "Destiny is a very loving dog. I got her a few days ago and Destiny was taught dog sign language, so now I need to find somewhere to teach myself." Other pets: Duke, Tiny, Buster and Munchie. Odin Town: Pittsburgh, Pennsylvania Deaf dog: Odin is now almost 2 and is a wonderful loyal friend. He still has no idea he is deaf and acts like any other dog. His size may intimidate someone at first, but once they see how he is nothing but a big lap dog, they can't help but fall in love with him. I do have to explain why he has to smell them with that big nose of his, but no one ever seems to mind once they realize he is deaf. Odin has turned out to be nothing but a blessing to us. Human companions: Kaitlin, 14, Jais, Jake, Dave, and Kim Hartman. Other pets: Lai La,Greater Swiss; Daisy & DeeDee,Maltese; Sprinter, Ariel & Nipper, cats; Cody & Peaches, birds; Freckles & Coca, rabbits; and Gracie, horse. Deaf dog: Casey is a 2 year old German Shepherd. "Casey apparently walked in to a woman named Deborah's office in Pittsburgh PA. She was very skinny and missing the hair on her belly and back legs. Deborah could not keep her and took her to the Humane Society. Then, she and her friends circulated an email asking someone to adopt or foster her. I had just lost my beloved Quike and was missing her terribly. I saw the email and decided I could pay something back for all the love Quike gave me. Now, after just 2 weeks she is completely at home. She plays with my other dogs and goes on long walks in the woods with me." Other pets: Various horses, dogs, cats, and donkeys. 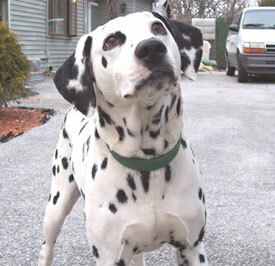 Deaf dog: Peyton is a dalmatian that is 3. We went to rescue Peyton outside of Chicago, after deciding we had room in our heart and home for him. Our 2 other dally rescues are not so happy with us as of this writing, heehee, we just got Peyton 2 days ago and everyone is still adapting to the new boy in the house.